In Margaret Atwood's The Handmaid's Tale, the United States, in reaction to Islamic terrorist attacks and reduced fertility rates, has devolved into an intolerant Christian-based religious society where women are stripped of their freedom and defined by their sole purpose as either a wife (Wife), womb (Handmaid), servant (Martha), prostitute (Jezebel), or propagandists (Aunt). Those who refuse these roles are stripped of the title of woman, being referred to as unwomen, and sent to colonies to do manual labor. 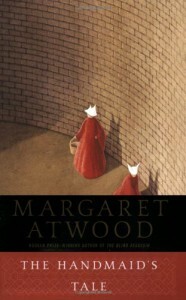 In light of the events of the last fifteen years in the United States, which include a terrorist attack by Islamic fundamentalists, the increasing political power of the religious right, loss of privacy and freedom based on fear, and several political moves that serve to undermine women's rights, Atwood's novel seems eerily predictive. Although the progression from a modern free society to an oppressive regime occurs too rapidly to be entirely believable, the resulting marginalization of women, religious fundamentalism, and overall loss of freedom seem very possible. It is this possibility that makes The Handmaid's Tale a truly terrifying read. I really enjoyed the Atwood's writing style, which is very distinctive. Her subdued prose effectively conveys the depression experienced by the novel's narrator, Offred. That said, it did take me a couple chapters to get used to the style, particularly because I was also confused about the world, which is unravelled slowly, creating some initial confusion. I liked Offred, but her lack of initiative, which she herself acknowledges, is frustrating at times, although understandable given her dire circumstances, the brainwashing she's endured, and the loss she's experienced. This novel deals with some pretty disturbing situations, and is not for the faint of heart. For anyone looking for a good dystopian novel, and who isn't afraid to deal with some unsettling topics, I recommend this book.